The Public Leadership Institute conducts a program of message and communications training for policy leaders called Voicing Our Values. 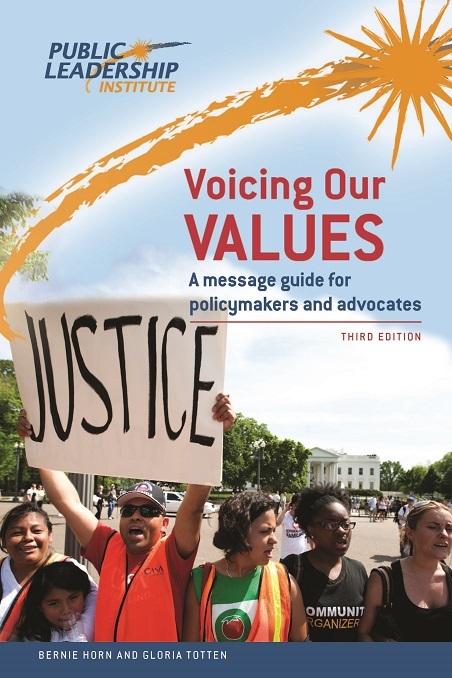 The cornerstone of the program is the annual publication of a message book, also titled Voicing Our Values, which includes practical messaging on many specific issue areas (e.g. budget and taxes, education, environment). We have distributed more than 2,500 copies of the book in paperback, it’s available on Amazon.com, and it can also be downloaded from our website in PDF format. In addition, we offer bi-weekly message webinars led by policy and communications specialists, and when invited, we present in-state message framing workshops for both elected officials and policy advocates.